Do not adjust your set: this really is a car you haven’t seen before. 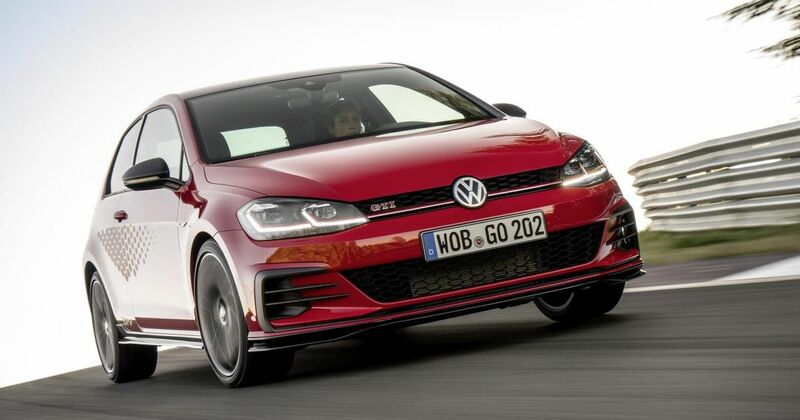 Yes, VW did reveal something with this exact same name and largely the same stats, but that was a concept shown off at the big Worthersee Treffen GTI festival in Austria last year. 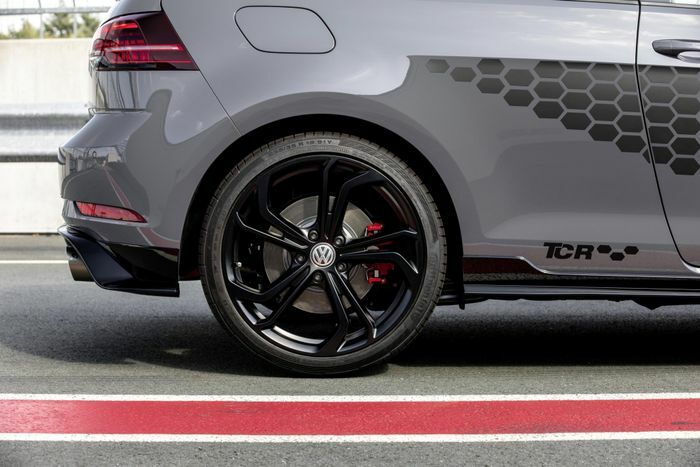 Now, the Golf GTI TCR has morphed into a production version. Not that ‘morphed’ is quite the right word - the one revealed last year was dubbed “very nearly production ready,” and sure enough, you’ll be hard pressed to see what’s changed. One notable departure is the top speed: while the concept was capable of 164mph, the production car tops out at ‘just’ 162mph. But hey, that’s close enough, and on a downhill stretch of autobahn with a good tail wind, 164 might still be doable. The speed is made possible via a 286bhp version of VW’s ‘EA888’ 2.0-litre inline-four turbo engine, although you will need to option the ‘Vmax’ upgrade to unlock the more impressive top whack - if you don’t, you’ll run into an electronic limiter at 155mph. On the way there, 0-62mph is dispatched in 5.6 seconds, a tenth quicker than a Honda Civic Type R and 0.6sec faster than VW’s own Golf GTI Performance. A manual gearbox isn’t available - you can only have the car with a seven-speed DSG automatic gearbox. Like the Performance, the TCR has VW’s clever electronically-controlled locking differential fitted. The chassis hasn’t been changed all that much - it sits 5mm lower, and you’ll now find a perforated brake disc at each corner. As standard, you can have either ‘Belvedere’ or ‘Milton Keynes’ alloy wheels, with both designs measuring 18-inches in diameter and shod in Continental Sport Contact 5P rubber. The TCR has also been visually enhanced with black mirror caps, new side skirts, a front splitter, a boot spoiler, and a rear diffuser. Open a door, and you’ll see some lovely TCR puddle lights in action. On the inside, you’ll find fancy microfibre-clad sports seats and a sportier steering wheel. This has the 12 o’clock position marked in red as well as perforated leather sections at 3 and 9 o’clock to remind you of the car’s stripped out GTI TCR racing cousin. Want to be absolutely sure your TCR isn’t mistaken for a boggo GTI? You might be interested in VW’s range of personalisation options. You can have a honeycomb ‘decor foil’ on the sides, carbonfibre mirror caps, a black roof and choose from a bunch different sets of 19-inch wheels. The Reifnitz wheels can be packaged together with the Vmax upgrade and adaptive dampers if you want, or if you’re rather serious about track days, the Pretoria rims can be bundled with Vmax and semi-slick tyres. We haven’t been told what they are, but Michelin Pilot Sport Cup 2s - which were optional on the Clubsport and standard on the Clubsport S - seem a likely choice. 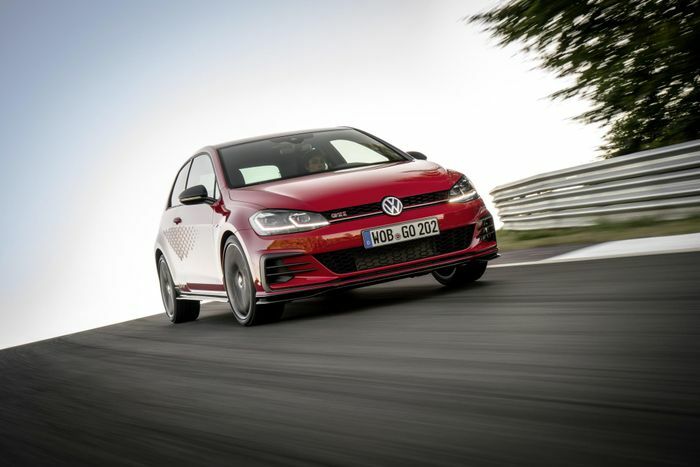 UK pricing hasn’t been revealed yet, but we can expect it to sit somewhere between the Golf GTI Performance and the Golf R. In Germany, it’ll set you back €38,950.